Me name be Swabbin' Marcy Cutler. Thanks so much for checking out my project! Click below to continue! Well shivers me timbers if it not yah best Mickey Pirate I've seen. There be no walking the plank for you. Fineglin' Yvette Blythe is pleased with yer Capn' Mickey! Pirate Hillary the Engorged loves the loot! Arrg! Bad-Rum Helga here, shiver me timbers. What a pirate man Mickey turned out to be. He could shiver my timbers anytime. Aarrr -- Cap'n Jan Beerbong here and she loves yer Pirate Mickey!! Aye -- ye did a mighty fine job (love the shading)!! AAArrrggghhh!! Pirate Joan the Rum-Swiller here dont ya know. This here map piece must be a part of the most bountiful booty! Gorgeous Kathryn Jones r-r-eporting,Cap'n. Love yrr work. Cap'n Bella Jellybones, sir. I'll be chasing ya around the deck till you drop. My pirate name is Pirate Antonia the Dagger LOL! This is a really cool mickey, adore it! Love this Captain Mickey!! Shaped cards are my favorites. Ham-hands Suzy here great job! Ahoy there me hearties! Greetings & thanks from down under. Well Cap'n Darby Knockboots, is in love with Mickey. Cap'n Mickey is great! Love the card you made with him! Can't wait to make this for my 21 year old maty!!! This will be perfect for my little pirate! Great card Candace! Blind Prunella Straw. Ahoy! Me Pirate name be Pirate Uma the Bitter. Me be thinking your card is very cute! Ahoy Me matety....Me name be "Pants-Down Bianca". Ahoy! Whinin' Julia Dread here. Thanks for the booty. Pirate Jimbo the Periwinkle here, arghhh, the card is rum! Really detailed work - thanks for sharing. Couldn't gtet it to work before. Sorry for twwo comments. Ahoy! Me be gorgeous Annie Drake! This is sure one cute pirate, matey. I be thankin' ye for it's cuteness. "Sharkbait" Hayley Scarr here and I be loving that pirate mouse. Love this Cap'n Jack Mickey card. Awesome! Pirate Bianca the Hatless!!! Love it! Me name be High-pitched Misty! Pox_Ridden Brit loves the Mickey Card!! Thanks for sharing, mate!! Decayin' Corliss Bones here! Love the Mickey Capt'n Jack Sparrow. Super cute. "Scurv-aceous" Darby Screed here - love the card! Ahoy, me Hearties - me name now be "Scurv-aceous" Carolyn Drake. Batten down the hatches . . . This is a really a wonderful card - just love it!!! Cap'n Hester KeelHaul reporting in! Arggg....love the card. WOW! love it. once again another amazing project. Scowlin' Marcy Napier be here and right pleased with yer project. Agnostic Agnes Dawkins here! Love have you made the freebie into a shaped card. Thank you for sharing. Pirate Lea the Parrotless here lovin the details on yarr Mickey card! Begad! Plank that malmsey-nosed seadog! Cap'n Bianca Bloodsmear here...love the card. Great job! Quadriplegic Doris Barbossa here. Darn good card. I be Ann Marie the Bald. Love ye card. I love how you intergrated mickey and the pirate so cute!! How cute!! Love this file! Luv the Mickey Pirate. I can use it on my Disney Cruise layouts! Eel Breath Kate here..love Mickey! Aye Captain! That's not to shabby a Mickey at'all! Me be lovin' the hat! Pirate Velma the Malformed loves your card. My daughter is creating a pirate costume for an event in Texas, so this hop is perfect timing. Love your card. 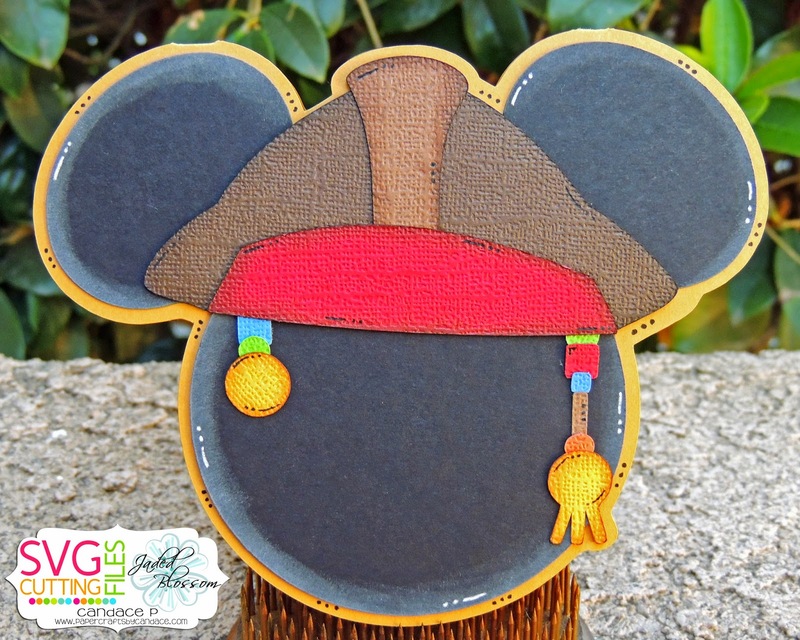 Bloody love this Mickey and his Captain Jack Sparrow hat card. Arghh Pirate Stu the Rum-Swiller here, love the Mickey! Way to cute! LOVE it! Arghh... Forgot to put me pirate name. Please don't make me walk the plank... Bilge Brain Lea -- should be Bilge Brain "Dead" Lea here leaving a proper comment....... Bloody Love this Mickey and his Captain Jack Sparrow Hat card. Arghh Pirate Frowning Roberta Drake says Awesome Job! pirate Kat Crookfinger sayin this be the finest Captain mickey !!! I'm Pirate Roberta the Well-Tanned Arrr...looks like yar ears be too big for ye hat mate! OMGoodness this is so fun!!! And I love me Pirate name Thiefin' Bette Dagger!! Love your card as well !!! 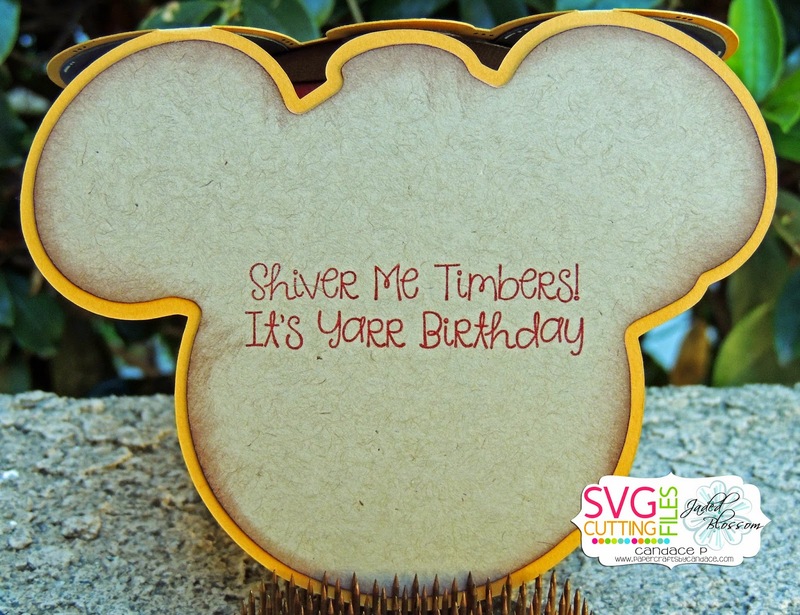 LOVE that mickey themed card! Eek!!! Love the pirate Mickey!!! Too cute! Thanks for starting my day with a SMILE!!! Smugglin' Louie Cutty here, Arr that is a mighty fine Mickey card! Cap'n Azriel No-Beard loves yer card, matey!! That is so adorable - definitely fitting for Mickey! Sweatin' Val Dagger loves me Mickey!! How very cute! I love it!! To err is human to arrrr is pirate! Nice card. Very cute. Perfect for my Disney pages! The pirate Yellow Abigail Smythe says super great card! Cheatin Agnes Slaughter is saying that this is a cute card and don't argue with me! Pirate Andrea the Mauve Here! LOVE the card! Great silhouette of Mickey as a Pirate! Shiver me Timber it's Musket Ball Ramona and I lovey your project. Cap'n Ramona Jellybones loving the Mickey Pirate. Hello Mateys! Pirate Antonia the Mauve here. LOVE the MICKEY PIRATE CARD!!!!! Aye this is an arrrrrrrgh-some card! Cap't Jack would be proud! Pirate Shakira the Black loves this hop - ty! Saggin' Jowls Marie here to say this is awesome! Love how perfectly it goes with the sentiment! So fun! I love the Mickey head and adding the pirate to it make him even better!! You gals have done it again! So much fun. So darn cute and creative! Pirate Liza the Mauve here! Faith n Jibbits! Tis a great file! He be a frightful mousketeer! Musket Ball Bruno No walkn the plank for you - cute birthday card!!! Cap'n Marie Rotmeat here! That be a mighty arrrrghsome Mickey cARRRGHd! Fish Breath Wilma be loving the pirate Mickey card! No Neck Flora here! haha. I love your cute little project! TFS! Swishy Jasmine Dagger here and arrrr Love your Mickey card!!! I love this. I am big Mickey fan! The mickey shape is adorable! great job! Shivers, that's a swashbuckling Mickey! Snifflin' Adele Smithe 'ere, mighty fine! Eie, Tennis Elbow Avalon here. I am loving the details on the Micky shape Me harty!!! Pirate jean The Periwinkle here!! Aye love yer project! such an awesome card, i love it!